If you follow these instructions you will produce cider, but probably not very nice cider. With brewing a drink that is both alcoholic and great tasting, the devil is in the detail. To get a really good tasting cider (and that is actually quite easy to do) you need to be sure about each stage of the brewing process. 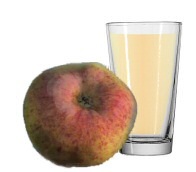 To make good quality hard cider you will need more detailed instructions, so read through this site and follow the step by step instructions. The instructions above ask you to add yeast to make your cider. Rather than buy a packet of yeast you could use the natural yeast spores that are in the environment. Yeast is a single celled form of fungi whose metabolism converts the sugars from the apple juice into alcohol and carbon dioxide. When you add a packet of yeast to your apple juice you are just speeding things up a bit and guaranteeing that the type of yeast is the one that produces the best flavoured cider. If you cannot find cider yeast, try wine yeast instead. If you cannot find wine yeast try beer yeast, and if there is none of that available, a teaspoon full off baking yeast will be enough for about a gallon of apple juice.